Bern  (German: Bern), the capital of Switzerland, is a small to medium sized city with a population of about 130,000 in the city proper and roughly 350,000 in the agglomeration area. It sits on a peninsula formed by the meandering turns of the river Aare. The remarkable design coherence of the Berne's old town has earned it a place on the UNESCO World Heritage List. It features 4 miles of arcaded walkways along streets decked out with fountains and clock-towers. 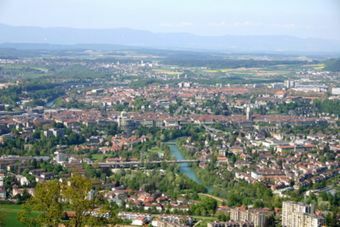 Bern was one of the eight host cities in the 2008 European Football Championships. Berne was founded in 1191 by Duke Berthold V von Zähringen and was part of the Holy Roman Empire. It was made a free imperial city by the Holy Roman Emperor Frederick II in 1218 after Berthold died without an heir. In 1353, Berne joined the Swiss confederation. After several successful conquests, Berne became the largest independent city state north of the Alps. It was occupied by French troops in 1798 during the French Revolutionary Wars, and was stripped of a large part of its territory. 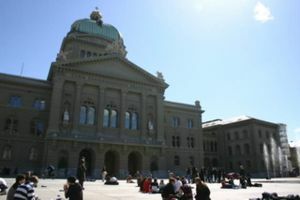 The city has been considered Switzerland's "Federal City" and therefore the de facto capital since 1848, as it is the seat of both the Federal Council and Federal Assembly. High technology for the 13th century. The 'Zytglogge' clock tower is found in the center of the old-town. The main language spoken in Berne is Bernese-German, a local Swiss-German dialect, although most people also speak Standard German. The dialect is mostly spoken, but also used in text messages etc. In official publications and announcements, Standard German is used. English seems to be supplanting French as the favorite second language of the Bernese, even though the canton of Berne is a bilingual German and French speaking canton. However, many people you encounter as a tourist will be able to speak both so it's certainly worth a try. Berne is in the center of Switzerland and is very well connected with the rest of the country. Berne is connected to Zurich Airport (ZRH) in 75 minutes by IC train routes St. Gallen - Winterthur - Zürich Hbf - Berne - Genève Aéroport or Romanshorn - Winterthur - Zürich Hbf - Berne - Brig. From Geneva Airport (GVA) there are direct IC trains to Bern which take approx. 2 hours. Bern is conveniently located in the vast network of Swiss Federal Railway between Geneva, Basel and Zurich and is served twice per hour by express (InterCity) trains from each of these cities as well as Zürich and Geneva airports. Hourly express trains take you into all directions, including Interlaken, Brig, and Lucerne. Berne is easily reachable with the national motorway network from all directions and has several exits from motorways A1, A12 and A6. Berne has an excellent public transportation system, with frequent local city services provided by trams, trolleybuses and buses, together with an S-Bahn rail system for longer journeys into the surrounding suburbs. The city center of Berne is easily accessible by foot. You can get around the main shopping area and restaurants simply by walking. But if you are going to go outside of the city center in areas like Guisanplatz, it's better to go by tram unless you want to be walking for 45 minutes. Berne's S-Bahn rail system will take you to many places in the suburbs and even to other nearby cities like Biel, Thun, Fribourg or Solothurn. As in most Swiss cities, free parking space is rare and the paying ones in the city center are quite expensive. As the center is quite small and all of the major attractions are within a mile walking distance it's a good choice to park in a "park and ride" and take public transport to the center of town. You can get a free bike for four hours at "Bern rollt" . All you need is a passport or an ID and 20 CHF for deposit, and you can explore Berne by bike. After four hours, you'll have to pay 1 CHF for each additional hour. There are three places where you can get bikes (see map ): Milchgässli/Hauptbahnhof (main station), open all year. Hirschengraben and Zeughausgasse, open from May to October. Berne is full of history and museums. It also has quite a bit of public art, all of which is marked on a walking map which is available from the tourist office in the train station for free. Swimming in the river Aare. On hot summer days, let yourself drift for some kilometers in the river Aare. Good (and safe) stretches are between the Kornhausbridge and the public pool of the Lorraine (old fashioned swimming pool just next to the river) and between the Eichholz and the public pool of the Marzili. Other stretches such as swimming the bend around the old town (starting at the "Englische Anlagen" to the Lorraine) or the "Bremgartenschlaufe" are only to be done by good swimmers accompanied by experienced locals. Note: Some sections of the river cannot be passed by swimmers due to barriers of hydraulic power stations (e.g. downstream of Marzili and downstream of Lorraine). An overview is provided by the Aarekarte  (a map showing dangerous areas related to water activities along the river Aare). Up-to-date information about the water level and the water temperature can be found on . 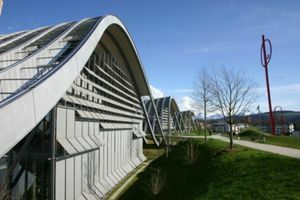 Berne is home to the prestigious University of Berne  which currently enrolls approximately 13,000 students. In addition, the city has the University of Applied Science also known as Berner Fachhochschule. There are also many vocational schools and an office of the Goethe Institut. As with most other cities in Switzerland, store opening and closing hours in Berne are strictly regulated. All stores, including grocers, close by 7PM or 7.30pm from Monday to Friday, except on Thursdays when they remain open until 9.30PM. Aldi supermarkets are an exception, closing at 8PM during the week. On Saturdays everything must close by 5PM. On Sundays, all stores are closed, except for those in the main railway station, which are open 7 days a week until about 10PM, and which include Migros and Coop supermarkets. Rathausgasse and the streets parallel to it have any number of cute shops with an amazing range of handicraft and luxury goods. This is not the normal range of swiss souvenir stuff, but really interesting things. There are a couple of worthy examples below, but the real pleasure is in spending a few hours (or days) exploring the arcades and vitrines. Eating in Berne (or almost anywhere in Switzerland for that matter) can be an expensive proposition for foreign tourists. Be sure to "shop around" before deciding on a restaurant as many of them cater to foreign tourists (especially those serving traditional Swiss food) and have inflated their prices accordingly. Most Bernese natives prefer Italian, Asian, or other non-local cuisine so finding a traditional Swiss restaurant with acceptable prices can often be a daunting experience. Be patient and you will persevere without breaking the bank. Many Bernese will tell you that nightlife in Berne is not exactly what you might call spectacular, but they're probably comparing it to Zurich or Paris. There are quite a few good spots to hang out at. Most of the towns cooler bars are located around the main clubbing venues though. In the ancient Matte neighborhood, which is well worth a daytime visit too, you'll find nightlife options for almost every taste. The main train station has a tourist office on the west side on the ground floor. They'll try to help you find a hotel room, if you arrive without booking. However, it is better to book ahead if you can, as Berne is a capital city; the budget hotels do tend to fill up on the weekends. Berne has very little violent crime. However, as it is the capital, political demonstrations occur every few weeks on a variety of subjects, occasionally leading to police intervention. The central railway station often hosts drunks and vagrants at night, but they are rarely dangerous. The real problem is groups of drunkards, who should be avoided as they sometimes look for a fight. While police officers in Berne will happily help you out if you are in trouble or need information, they are also known for approaching "suspicious" persons to check their papers. This procedure is less annoying if you carry a photocopy of your passport and your onward ticket with you and stay calm and polite. Berne is an ideal gateway to the Bernese Highlands. You can make day trips to many famous and/or beautiful locations, like Spiez, Interlaken, Grindelwald, Jungfraujoch or Gstaad. This page was last edited on 24 August 2018, at 13:52.